The Ebola virus causes a highly infectious disease that can reach fatality rates of up to 90%. It causes a great deal of suffering, spreads really easily and if it’s not treated very early on can kill most people. It’s darn scary , but ever since it surfaced in 1976, when the first outbreaks in Congo and Sudan were reported, doctors have yet to find a cure. The best they can do is contain outbreaks and hope the virus doesn’t spread too far. So far, they’ve been somewhat successful, yet outbreaks have continued to appear here and there and this year was the worst by far. Some 700 people have died since February and foreign doctors who were sent to Western Africa to treat and contain infections became infected themselves. The Ebola viral disease is a terrible illness. Initially, the infection sparks high fever, followed by joint and muscle aches, before progressing in vomiting, diarrhea and, in some cases, internal and external bleeding. The virus is easily transmittable between humans through bodily fluids, making it very difficult to contain especially in remote Africa where there’s poor hygiene facilities and education. Since the first cases of the virus were documented in remote tropical surroundings, doctors believed it is first contacted from chimpanzees, gorillas and forest antelope. 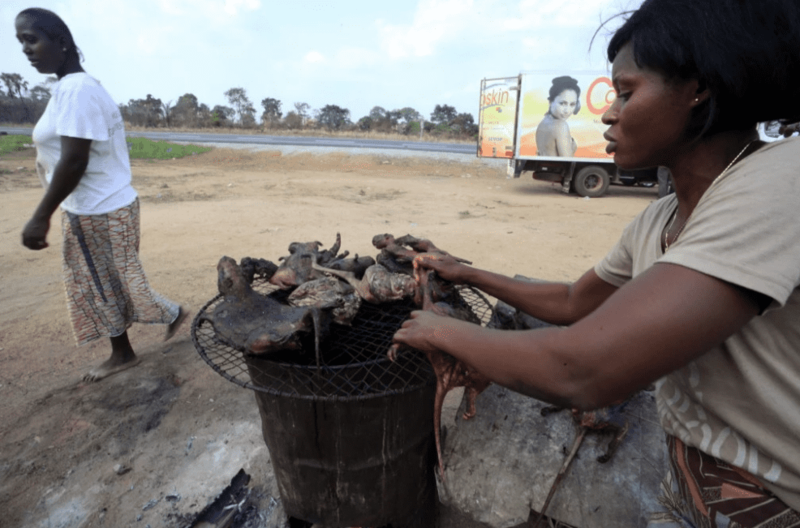 Often, bush meat coming from these animals is a precursor to the Ebola viral infection. There are six strains of Ebola discovered so far, five of which are transmittable to humans while one only infects monkey populations in the Philippines. 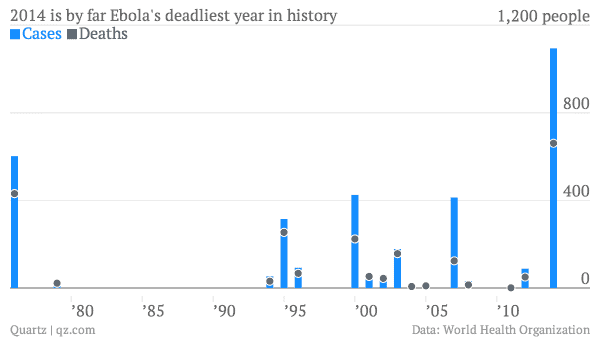 The graph above shows the evolution of Ebola outbreaks since the 1970s when it first surfaced. This year is the most dangerous one to date. As shown above, 2014 has seen the most cases and deaths from Ebola in history and comes after a period of more than a decade of relative peace. An epidemic of the deadly virus in West Africa is now “out of control” with more than 60 outbreak hot spots, Doctors Without Borders said. Guinea had the first reported cases at the start of the year, and is at the heart of the crisis, along with Nigeria, Sierra Leone and Liberia. 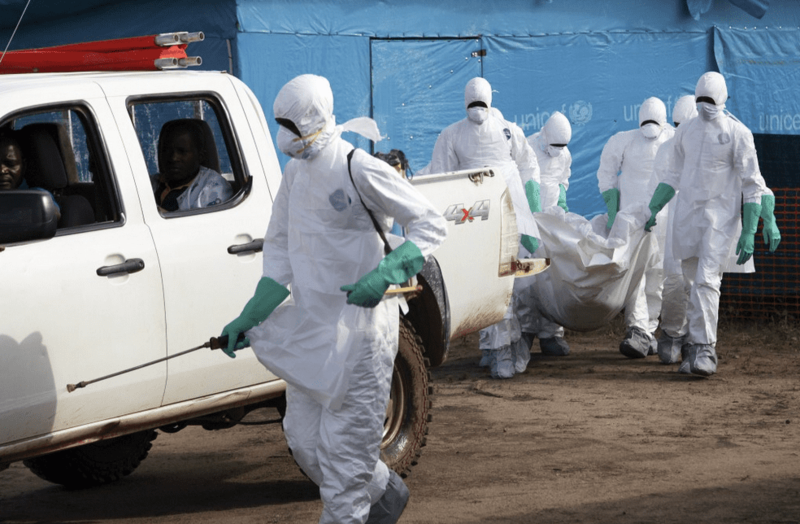 The Western African countries have sealed their borders or put check points on ‘red alert’, but efforts are severely hampered by the fact that those infected only start displaying symptoms three weeks after contracting the Ebola. What’s even worse however is lack of support from the general population, which in some parts of the infected regions have turned in riots. Health NGOs have repeatedly reported cases of mourners seizing the bodies of their family members so they might properly bury them according to custom. In some cases, families have outright refused to hand over the bodies of their deceased relatives to authorities, thus increasing the chance of infections. In Sierra Leone, which has the largest number of Ebola cases at present, thousands protested over the weekend outside the country’s main Ebola treatment facility in the eastern city of Kenema. Reuters reports that the demonstration was sparked by rumors that the Ebola outbreaks are not real and that the whole thing is nothing but a ruse used to justify “cannibalistic rituals” being carried out in the hospital.